Back then, many people have opted to not install window films because they feel that it makes their homes darker as well as spoil the view outside their homes. Due to the continuous devotion of glass film manufacturers to meet the demands of the people, several custom and decorative films are now developed to protect your home minus its dimming properties. For an affordable etched glass look, try the fasara line of decorative window films to instantly give your space a modern and sophisticated look. A decorative film is your home’s first line of defense against the sun’s harmful UV rays. It keeps your furniture from fading as well as keeping your home cooler. Because it is limiting the amount of heat coming in to your homes, you are saving money from your monthly cooling costs as well as keeping your cooling units from overwork. 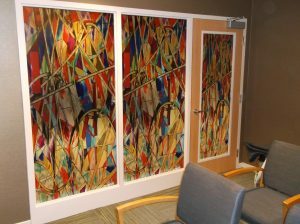 There are numerous designs for these window films available in the market today. Many businesses have taken advantage of colorful mural walls to instantly liven up their space. Safety films are also popular as it has a special pressure adhesive system that holds the glass together when it breaks.